Concerning Imgur: it's impossible to get registered with them and besides that they are about as discreet as Facebook with information which isn't acceptable to me. And Dropbox is just another "https" problem. I'm sorry for the delay but I'll have something for everybody to see tonight. Last edited by Drumaholic; Today at 12:39 AM. These aren't anything like each other, both are unique. You'll notice where I've pointed out the etching lines in the Arabic script, similar to what's seen in a type I trans stamp, but the shapes of these characters are not like on any other Avedis trademark. They have a stylized shape not like the standard type. By "stylized" I mean they can be recognized as characters that we've seen before, but with different bends and curves. The dots are different too. The English part looks to be about as large as what's seen on the later 1960's era trademarks. There is no etching in that part; only the Arabic has that. The Arabic script on Zenstat's has has different characters in a mix with more familiar parts that are uniquely stylized as well. It almost looks like a conglomeration between the Avedis and the old Constantinople K scripts combined. This one really is crazy/strange/beautiful. The English part on this one is the very 1st type of trademark that they ever used which I call the "early 1930's type A", and the "signature" type confirms that. Both of these need to be filed under the "W.T.F." category, because that was precisely my reaction upon seeing both for the first time. Last edited by Drumaholic; Today at 12:44 AM. I asked Zen. if Avedis stamped the 14 in the cymbal, he did not reply. Do you think Avedis stamped the 14 in it. 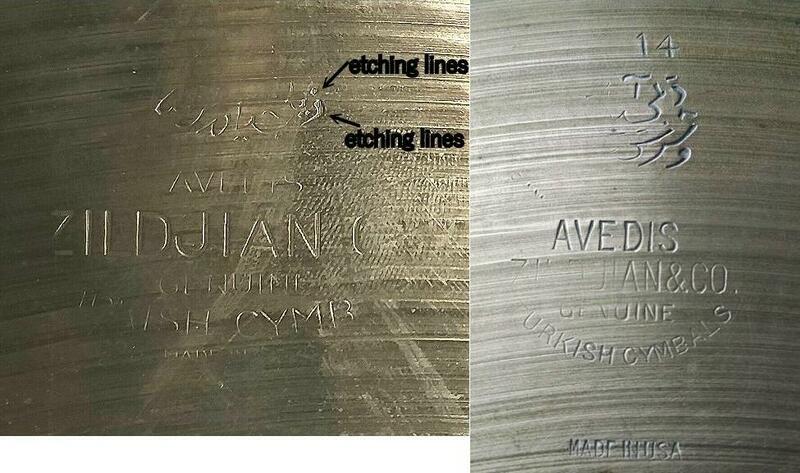 I ask because Avedis didn't buy/make the numerical stamp key just to stamp 14 in that one cymbal, so what else did they stamp numerically? I have never seen any numbers stamped with the logo ever before in all my time here on this site.